Locksmith Craig receives a shock on BBC’s Michael McIntyre’s Big Show! Shock, unlock and amaze, our Locksmith Craig receives a shock on BBC’s Michael McIntyre’s Big Show! Keytek®’s very own Technical Manager and resident locksmith Craig Hayward received the shock of his life last Saturday night when he appeared on the BBC One Saturday night television show – Michael McIntyre’s Big Show! Craig arrived at the London Theatre Royal with our Marketing Director under the impression he had gone to sign up a new account. Whilst he was there a member of their production team (unknown to Craig) asked him to unlock a door they had ‘lost the keys to’. The door Craig needed to work on had conveniently been placed in a fake corridor, which lead to the stage of the London Theatre. 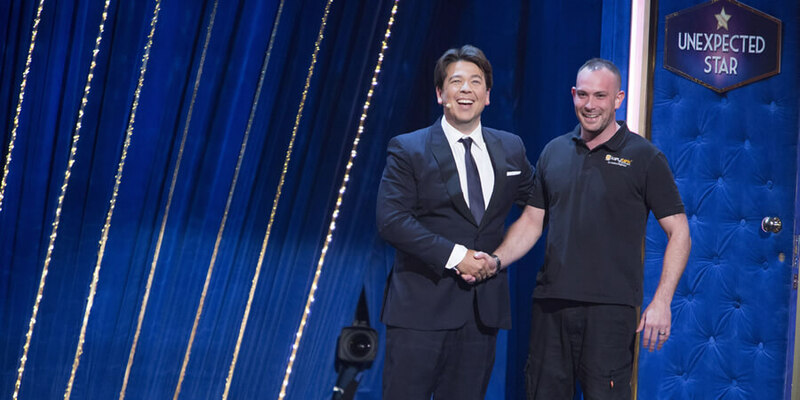 Craig unlocked the door and found himself on stage with Michael McIntyre and became the unexpected star of the show! To his amazement more than 2000 people including Craig’s friends, family and work colleagues were there to greet him as he opened the door! After the initial shock of making an unexpected appearance on stage, Michael asked Craig if he could carry out another locksmith task. A large crate was on stage which Michael asked Craig to open, Craig picked the padlock that was holding the crate shut with no problem, only to open it and find his wife inside!! Michael then asked Craig if he would help him with one final task for the show finale, Craig accepted and found himself agreeing to take part in an escapology illusion! After a little rehearsal, the time came for Craig to take the centre stage. Craig had to climb into a box with giant blades at either side and have his hands padlocked outside of it. Craig would need to pick the locks before the blades cut into the box, Craig succeeded in his challenge and if by magic he appeared in the stalls of the theatre. The show was spectacular; full of music stars and celebrities and of course Keytek®’s Locksmith Craig. If you would like to take a look at the show you can currently view on it BBC iPlayer. To go straight to the ‘Unexpected Star’ part of the show click here.